The church of St George in Toddington is situated in the heart of the village on the village green. Parking is available on the streets around the green. 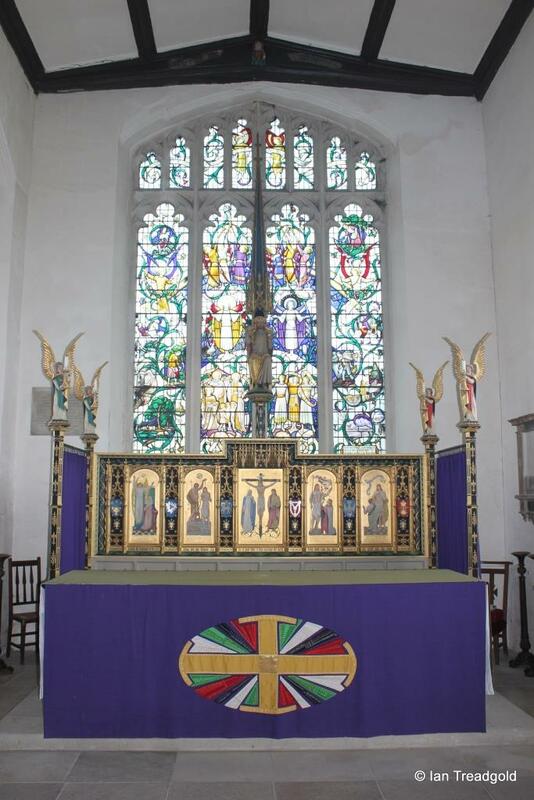 The church is cruciform in layout and consists of a chancel, crossing, nave, north and south transepts, aisles and porches, a central tower and a vestry to the north of the chancel. 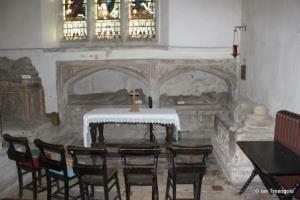 The chancel is around 36 feet by 18 feet and the nave some 52 feet by 21 feet. The aisles are around 8 feet wide, the south transept is some 20 feet by 22 feet and the north transept is larger at around 21 feet by 24 feet. The central tower is around 15 feet square and some 90 feet high. 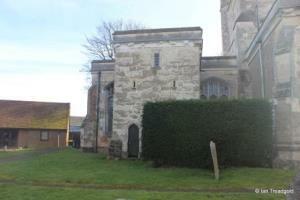 The church dates from the early C13 with some rebuilding and addition of the clerestory in C15. 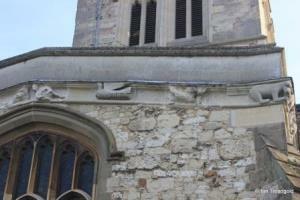 Much of the church is built from local Totternhoe stone with the clerestory using Bedfordshire ironstone. Repairs over the years have often been made in brick and cobble with more recent works reverting to stone in line with the original. 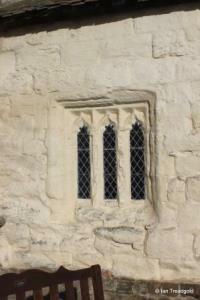 The softness of the Totternhoe stone is very clear from parts of the fabric, notably the south porch and the parapet frieze on the north side. 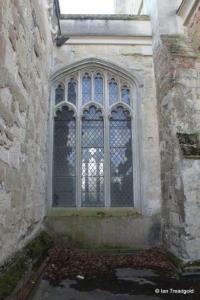 The south side of the chancel has two large windows to the east and west of the priest’s door. 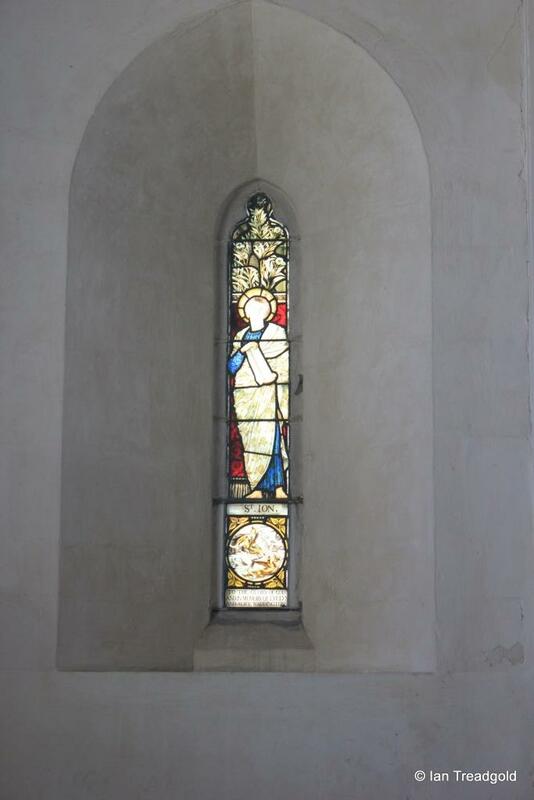 The restored eastern window is of three cinquefoiled lights with perpendicular tracery above under a four-centred arch with a hood mould over. The door way is under a square head. 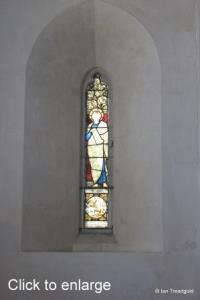 The western window is of three cinquefoiled lights with the outer lights having small quatrefoil designs in their heads with a larger quatrefoil above the central light all under a semi-circular arch. 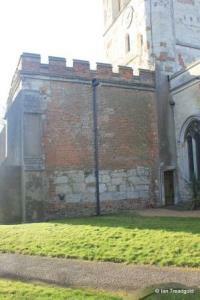 The east wall of the south transept has been restored chiefly with brick, including the embattled parapet. 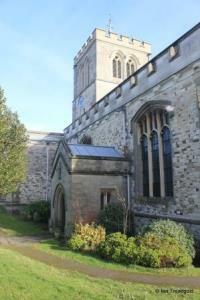 The external door in the angle between the transept and the chancel leads to the octagonal stair turret in the south-east corner of the tower. 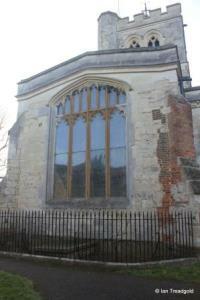 The south face of the south transept has some restoration in brick but is predominantly restored with cobbles. 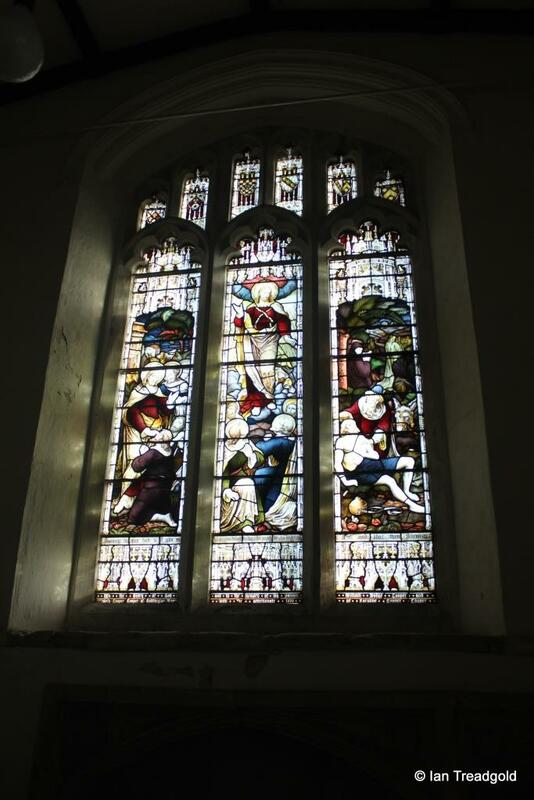 The memorial to the east of the window is in memory of Sarah Garlick who died in 1813. 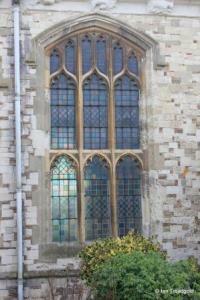 The restored window is of three cinquefoiled lights with perpendicular tracery under a four-centred arch. 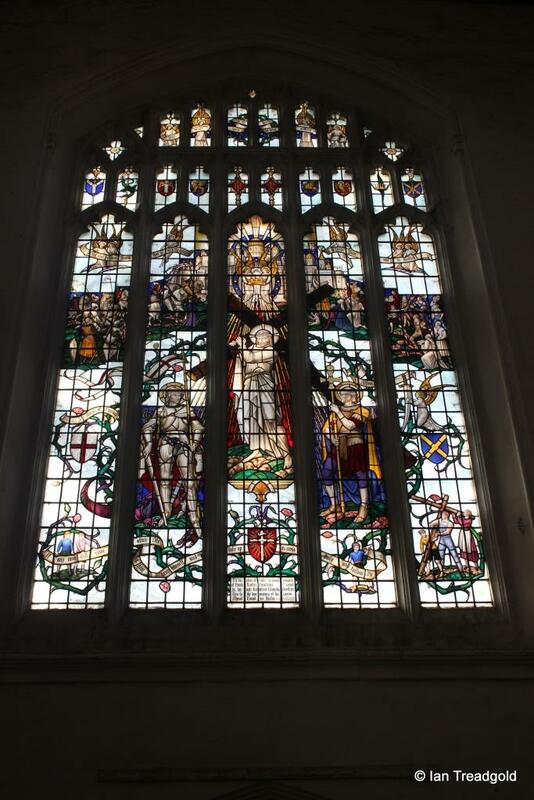 The glass in the Cheney Chapel depicts Faith, Hope and Charity and dates from 1892 and is in memory of William and Elizabeth Cooper Cooper of Toddington Manor provided by their daughter Caroline. 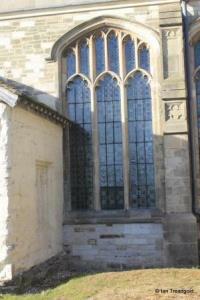 The south aisle has three windows surrounding the south porch, two to the east and one to the west and there is a single lancet window to the west. 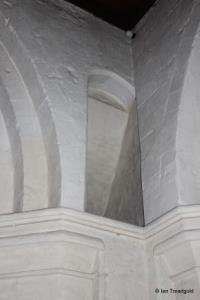 The clerestory above has four three light windows with cinquefoil tracery under straightened four-centred arches. 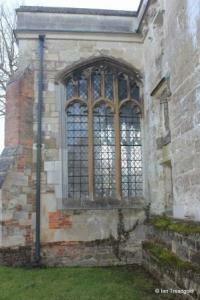 The two windows to the east of the porch are of the same style and size, both being of three cinquefoiled lights with perpendicular tracery above under four-centred heads. 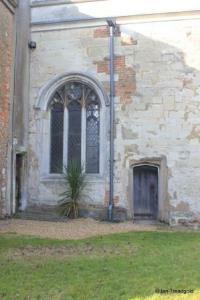 The south porch is showing the ravages of time and the softness of the Totternhoe stone. 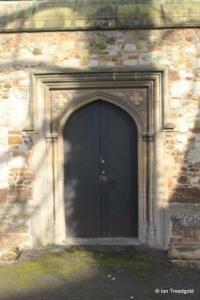 The outer door itself is within a pointed arch with a square head and plain spandrels. 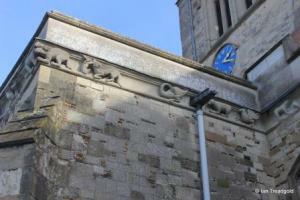 There are square headed three light windows to the east and west of the porch and a sundial over the doorway. 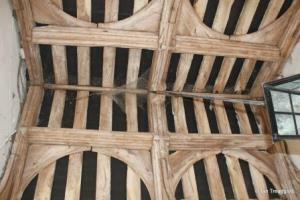 The timber roof of the porch has six wood carvings supporting the beams. 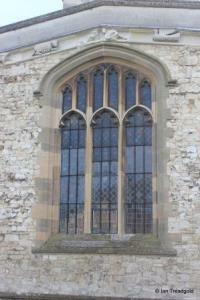 The window to the west of the porch is similar to its neighbours to the east of the porch but shorter. 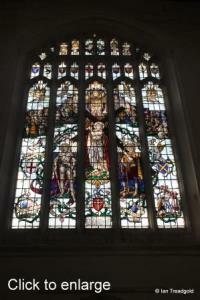 The small lancet window in the west end of the south aisle has glass dating from 1880 depicting St John (Ion) and was placed in memory of Evelyn and Alice Waddington by the then rector Revd CE Haslam. 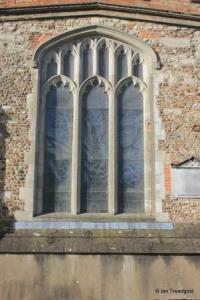 The west end of the church has a grand window over the west doorway. 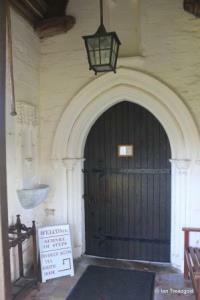 The doorway itself dates from C15 and is in two moulded orders with the inner leading to a four-centred arch whilst the outer is a square head with restored quatrefoil designs in the spandrels under a further squared headed hood mould. 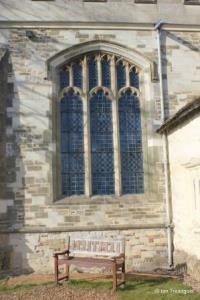 The restored west window dates from C15 and is of five cinquefoiled lights with extensive perpendicular tracery above under a four-centred arch. 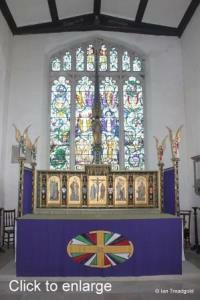 The glass depicts Christ carrying the cross and is accompanied by the church’s patron saint, St George and St Alban. It was erected in memory of Frank Walter Faulkner and to his cousin Maud Bond by his wife Winifred Blanche Faulkner and dates from the 1940’s. The north aisle has a similar layout of windows to that in the south aisle with the exception that there is no west window. 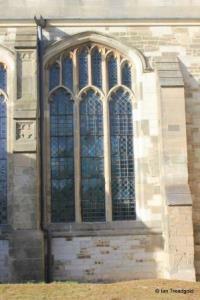 The western window on the north aisle is identical to that on the south aisle. 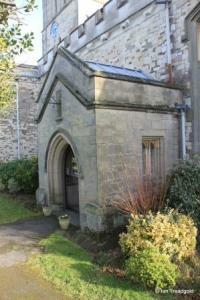 The north porch was rebuilt in 1898 using ashlar masonry with a plain parapet. 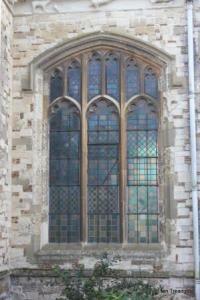 It has windows to the east and west consisting of two joined single cinquefoiled lights under a square head. 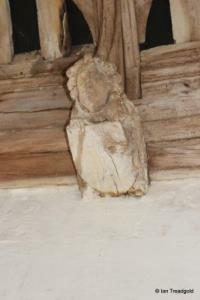 Inside the porch there is a holy water stoup with a crocketed canopy to the east of the door. 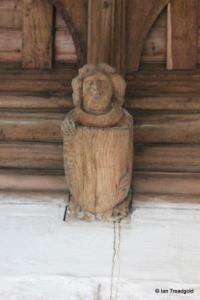 The wooden roof of the porch has carved figures similar to those in the south porch. 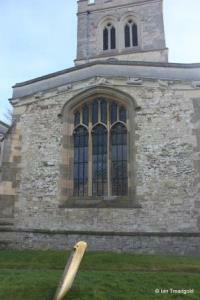 There are two windows to the east of the porch in the north aisle. 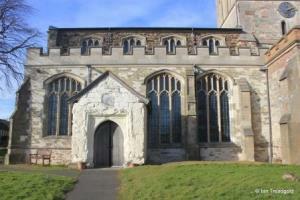 The western is of three cinquefoiled lights with a transom and perpendicular tracery above under a four-centred arch whilst the eastern matches its companion in the south aisle although it is shorter in height. 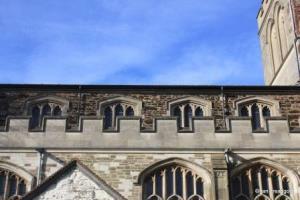 The north transept only has a window to the north and it is a similar style to many of the other windows in the church with three cinquefoiled lights with perpendicular tracery above under a four-centred arch. 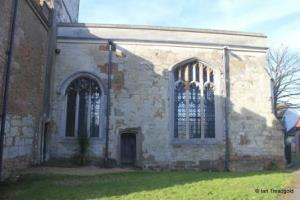 The north side of the chancel is blighted by the very severe three storey vestry adjoining the north wall of the chancel. 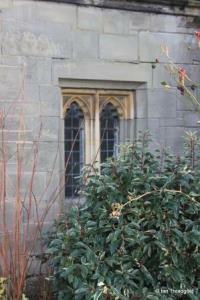 To the west of the vestry in an alcove formed by the north transept, the vestry, the north wall of the chancel and hidden by a hedge is a three-light window of similar style to many of the others in the church. 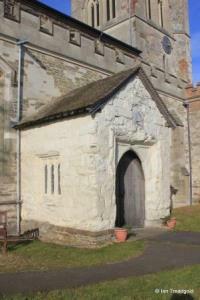 The vestry itself dates from C15 and has its own external access as well as access into the chancel. 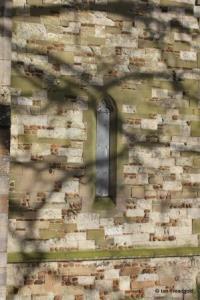 There are three windows in the east wall of the vestry, one on each floor and a small window on the north side. 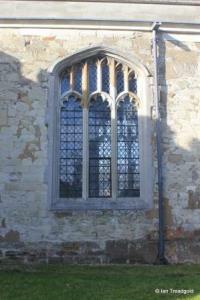 The east end of the north side of the chancel has a window matching the other three-light windows in the church. 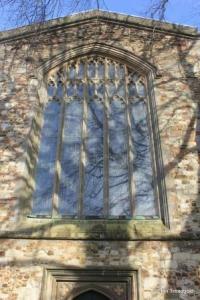 The east window is much restored and of four cinquefoiled lights with perpendicular tracery under a four-centred arch. 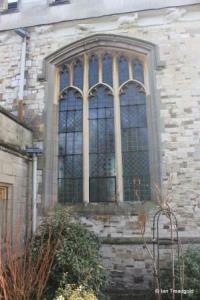 The glass in the window dates from 1948 and was raised in remembrance of William Hyde CBE by his wife Gladys. William Hyde was a local JP and formed the Toddington Old Boys Association in 1943. 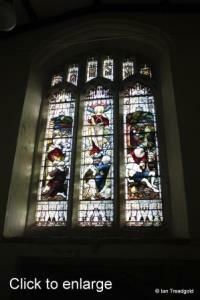 The glass depicts various scenes of Christian belief. 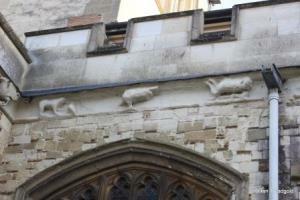 One of the highlights of the church is the frieze around the parapet on the north side of the church. Whilst sadly eroded now in many places, several of the figures have been replaced in modern times and examples are shown below. 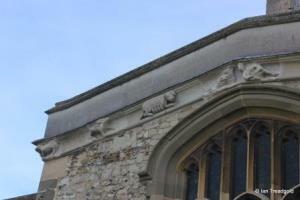 More detail on the frieze is available in an excellent pamphlet available on the Friends of Toddington Church website here. 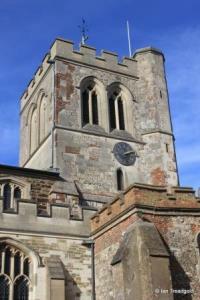 The central tower rises to some 90 feet with an octagonal stair turret in the south-east corner accessed from the angle of the chancel and the south transept. 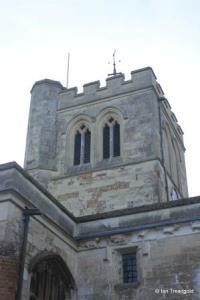 The tower has an embattled parapet and the belfry openings are conjoined pairs of two trefoiled lights with a quatrefoil above under two-centred arches. There are clock face to the north and south. 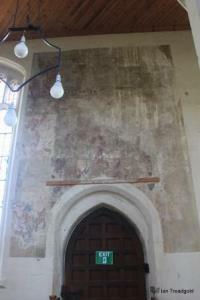 Within the church are several wall paintings over both north and south doorways and in the south aisle. 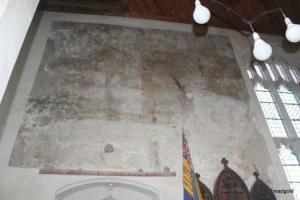 All are now sadly very faint and were covered in limewash until being uncovered in C19. 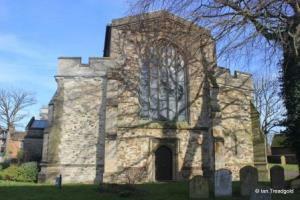 The south transept is known as the Cheney Chapel and contains a small altar and a double piscina dating from C13 in the south wall. 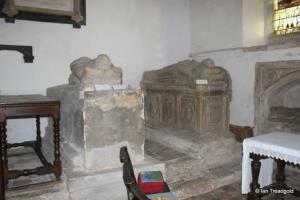 In the Cheney Chapel are several tomb monuments to the Peyvre and Cheney families owners of the manor Toddington. 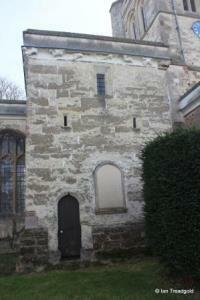 The Peyvre family were Lords of the manor between C12 and C15. 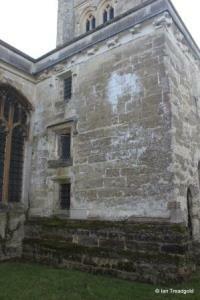 Buried in a tomb against the west wall of the transept is Nicholas Peyvre who died in 1361. 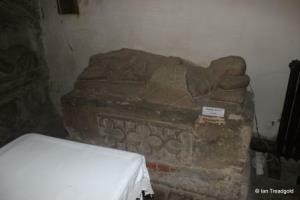 He was born in Ampthill in 1318 and died in Chilton in Buckinghamshire before being interred in Toddington in 1362. He was the father of Thomas Peyvre. Thomas Peyvre was the son of Nicholas and was born in 1344 and died in 1429. 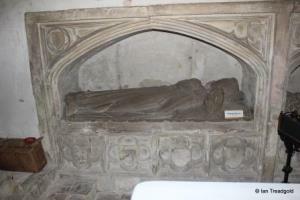 Thomas’s wife Margaret Peyvre nee Loring was born around 1335 and died in 1407. 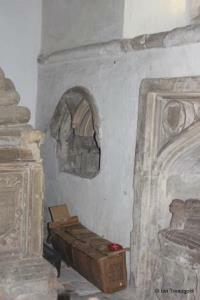 The tombs of Thomas and Margaret are side by side in the south wall of the Chapel. The manor of Toddington passed through the Broughton family in C16 before the estate was split around 1530 with Anne Broughton inheriting the Toddington estates. She married Thomas Cheney in 1539 and died in 1561. 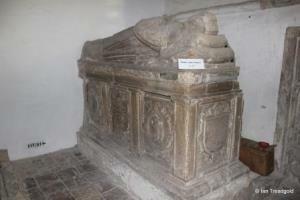 Thomas Cheney was the Lord Warden of the Cinque Ports and died in 1558 before being buried on the Isle of Sheppey. 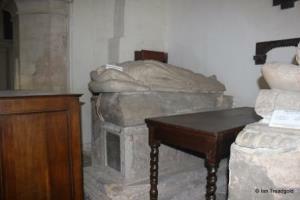 Anne Cheney’s tomb is in the south-east corner of the Chapel. Thomas and Anne had two children, Anne and Henry. Henry was born in 1540 in Kent was knighted in 1563 by Queen Elizabeth in Toddington and named Lord Cheney of Toddington in 1578 before going on to be one of the judges at the trial of Mary Queen of Scots. 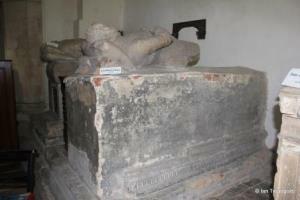 He died in 1587 in Toddington and his monument is in the middle of the three on the east side of the Chapel. 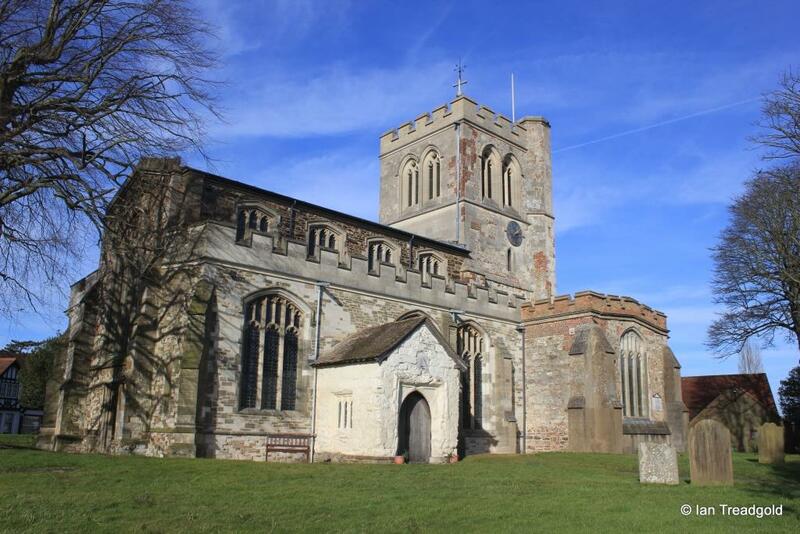 Henry Cheney married Jane Wentworth around 1565 in Nettlestead, Suffolk Jane’s birthplace. 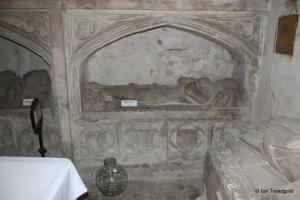 Jane had the monument to Henry erected before she died herself in 1614. Jane’s monument is in the north-east corner of the Chapel. 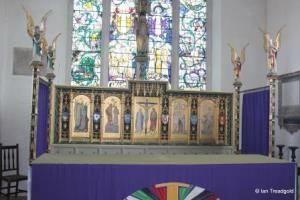 The reredos behind the altar dates from restoration work in the chancel in around 1885 and was rededicated in 1949. Remains of the rood stair leading from the north transept are visible in the angle between the north transept and the crossing. 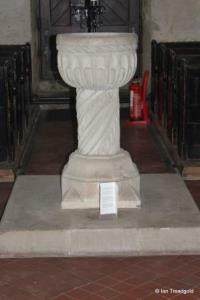 The font, at the west end of the church between the two doorways, is in a Romanesque style on an octagonal base with a single twisted column leading to a round fluted bowl.